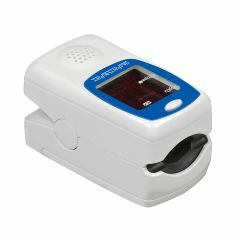 AllegroMedical.com presents The SmartHeart Talking Pulse Oximeter. The SmartHeart Talking Pulse Oximeter unit accomodates a wide range of finger sizes and features an easy-to-read large LCD display and backlight while accurately measuring blood-oxygen saturation and pulse rate with audible results announcement. The SmartHeart Finger Pulse Oximeter is a smart way to keep an eye on your heart rate while doing physical activities. It accurately measures oxygen saturation of arterial hemoglobin and your pulse rate. It accommodates a wide range of finger sizes and features an easy-to-read large LCD display with red backlight. This oxygen saturation monitor has a low-battery indicator and an automatic shutoff. It includes two AAA batteries and a neck strap with quick-release lanyard. No prescription is required to use this finger pulse oximeter. The display shows the blood-oxygen saturation (SpO2), pulse rate and pulse bar. It also comes in an environmentally friendly 100 percent recyclable package. This product is intended solely for use to monitor heart rate during exercise, sports and aviation activities. Not intended for continuous monitoring. This unit is not a medical device and is not intended to diagnose or treat any medical condition or disease.